In the small French village of Caylar, in the Larzac region of south-central France, two tall sculptured shepherds stand sentinel in the central square. One is, appropriately, accompanied by a sheep and horse, the other by a buxom young woman whose body emerges from the trunk of a century-old elm. 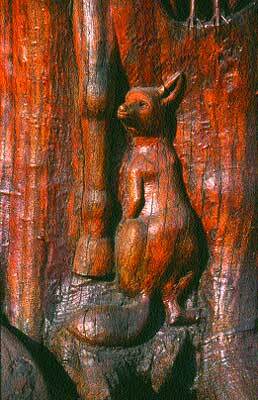 Around them, half-hidden or emerging from the tree's upper branches, realistic carvings of local animals and plants vie for the attention of passers-by. 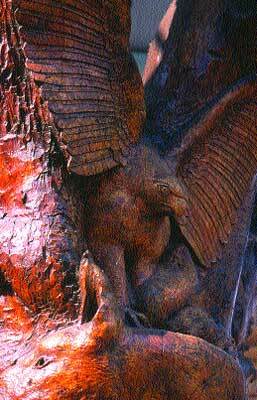 The carved elm of Caylar is one of the most extraordinary trees in the region. Yet 20 years ago, when Dutch elm disease devastated Europe's elms, it seemed that, like many of the continent's elms, it too would be razed and cut up for firewood. The people of Caylar, however, were especially attached to their central elm. In a region of windswept plateaux, elms are particularly rare, although it has long been a tradition in Larzac villages to plant elms in the village squares for shade and as a symbol of life and longevity. Without its symbolic elm, Caylar just wouldn't be the same. But what to do with a lifeless, disease-ridden elm? 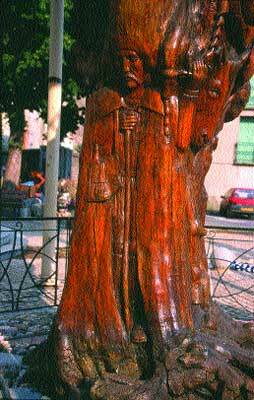 The villagers and town council came up with a unique solution: the tree would be kept in situ and transformed into a monumental sculpture representing the rural life and legends of the surrounding area. The tree was uprooted. Its roots and smaller branches lopped off and burned. And the main trunk and branches treated with a strong preservative. 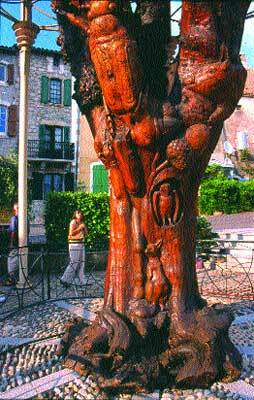 The elm was then replaced in the square, a few metres from its original location, where a local artist of Breton origin, Michel Chevray, began to transform the tree into a monumental sculpture. "When the tree was dug up," explained Chevray, "there was an extraordinary mass of roots which I wanted to integrate into the project. But unfortunately they were cut off and thrown away before I could use them." However, there was much left to inspire the Breton artist who spent six weeks preparing sketches and overall plans for the town council. Although primarily an abstract artist, Chevray learnt sculptural techniques during his five years at art college. Before moving to the Herault Departement in 1980, he created props for a Parisian theatre company, and later produced resin sculptures for a local theatre group, La Compagnie Asphodeles. In Caylar, Chevray adopted a realistic, figurative approach to the project. In a region known for its flocks of sheep, traditional agriculture was an obvious theme, and one that pleased the mayor and local councillors. 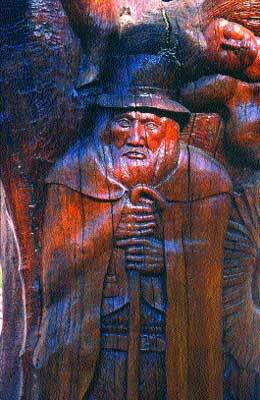 On opposite sides of the lower trunk, Chevray carved two shepherds; one with a cloak, a staff and a beard and the other with a characteristic Gallic moustache and, somewhat incongruously, slightly flattened, almost Oriental features. 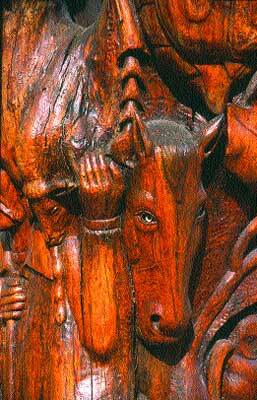 The first shepherd carries a lamb on his shoulder while a horse looks on. The second cloak-clad figure is accompanied by his dog and, above him, the torso of a naked young woman; a reflection, perhaps, of his daydreams on long, lonely days on the Larzac plateaux. 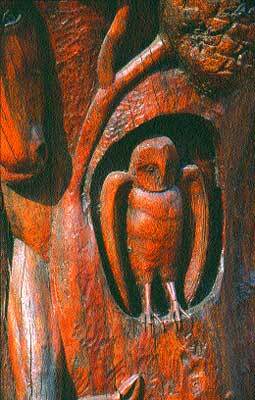 The carved wildlife includes an owl peeping from a hole in the main trunk, a timid fox and an eagle, or other bird of prey, stretching its wings where the main branches divide from the trunk. Lower down a game bird, probably a partridge, hesitates to break cover. 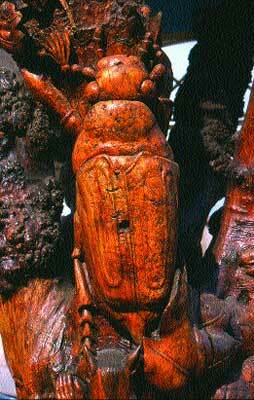 There is also a giant cicada, one of the most emblematic insects of the Midi, a frog, a lizard and two snakes. The sought-after morel mushroom, a large acorn from Larzac's scrub oak trees, and a large stylised thistle represents the region's flora. In the Larzac, dried thistles are a common sight in the villages and farmsteads where they are hung on the doors as a sort of barometer of the local weather; tight leaves herald a dry spell, more open leaves, damp and rainy weather. While the Caylar elm is essentially concerned with tradition and nature, the modern world is briefly represented too. High up on the elm's smaller branches is a portrayal of a hang-glider engaged in one of the region's most popular outdoor sports. Carving the elm was a mammoth task. Over two seasons, from April to September, Chevray worked from scaffolding and ladders, chiselling away at the soft elm. 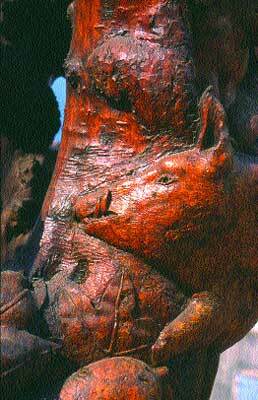 In all he worked around 2000 hours, completing the carving in autumn 1989 after 14 months work. Despite the fact that Chevray is, above all, an abstract artist and spends half the year in southern India, numerous sculptural commissions have been awarded since the completion of the Caylar tree. During the 1990s Chevray has worked intermittently with a local theatre company, producing resin sculptures for use on stage. 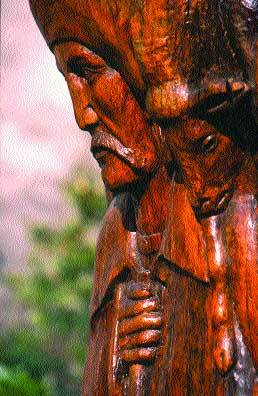 More recently he carved a second tree, a 400 year-old-oak at Saint Clement de Riviere just north of Montpellier. "The oak died in the early nineties," explained Chevray. 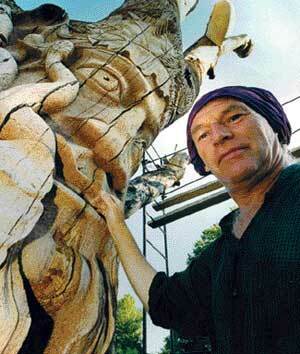 "I just carved the roadside facade so it only took six months to complete. The tree has a huge crown which I call 'nature's dancer'." The shape of the tree, and a well-known Festival of Dance in nearby Montpellier, inspired Chevray to carve a dancer, whose face appears on the lower trunk. 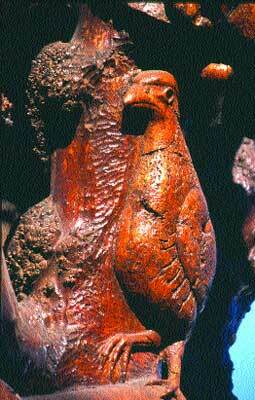 The face resembles a 'green man' of the wood, with startled-looking eyes, buck teeth, and leaves and flowers in his hair. Higher up, some of the branches have been turned into abstract, rippled limbs, like ribbed flexible tubing. One dead branch becomes the neck and head of a heron, with its body emerging from the trunk. An original touch is a huge slug, which seems to glide along one ribbed branch. Its slimy body suggested itself from the form of a darkened part of the gnarled tree. Two small branches - its antenna - peek from its head. Chevray added a carved, rounded stone for the shell. "The stone was at the base of the tree," explained Chevray, "and probably came from the ruins of a chateau opposite. 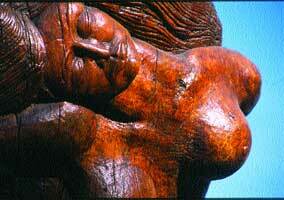 It seemed appropriate to integrate it into the sculpture." 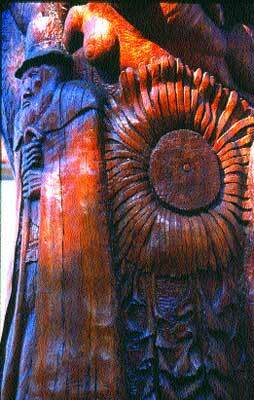 Although the carved oak is a much smaller work than Caylar's massive elm, the oak was more difficult to carve. "The tree had been dead for seven years," said Chevray. "It was so hard I almost broke my tools." Unlike the Caylar elm, however, the oak stands unprotected on the edge of a field, its dead roots still anchored in the ground, its crown and sculptures exposed to the winds and rain. In Caylar, Chevray's first sculptured tree has been protected with its own glass and steel kiosk, like a tall, slender bandstand. But Chevray has reservations about the well-intentioned efforts to protect his work. "No one likes the kiosk," he claims. "It's awful, scandalous. I hope that something better can be built in the future." "While the Caylar elm is essentially concerned with tradition and nature, the modern world is briefly represented too"